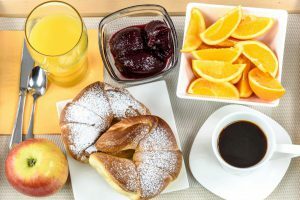 At breakfast we greet our guests with a delicious sweet and savoury breakfast with fresh pastries and homemade cakes, yogurt, cereal, fruit juice, cold cuts, cheese, fresh fruit and tinned fruit, and freshly baked fragrant croissants of various kinds. In the recently renovated dining room, the chef presents his rich menus every day. At each meal there are three different menus of meat and fish accompanied by buffets of vegetables and side dishes. The dishes are made with fresh seasonal products, and cooked according to traditional regional and national recipes. Don’t miss out on our pizzas, focaccia, canapés, piadine and pies that give meals that extra touch! We always provide a choice of very fresh desserts. We also guarantee that we are always available to make any changes due to special dietary needs.